WTMC-1979-Top 40/Rock "The Music Connection"
WTMC-1984-Adult Standards "The Station You Grew Up With"
WTMC-1997-CNN Headline News "CNN News 1290"
WCFI-1999-AP News Radio "News Radio 1290"
Thanks to Marc Tyll for this history of WTMC. 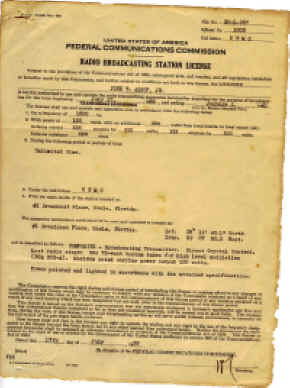 Ocala’s oldest and most respected radio station WTMC commenced regular broadcast service during the Summer of 1939. 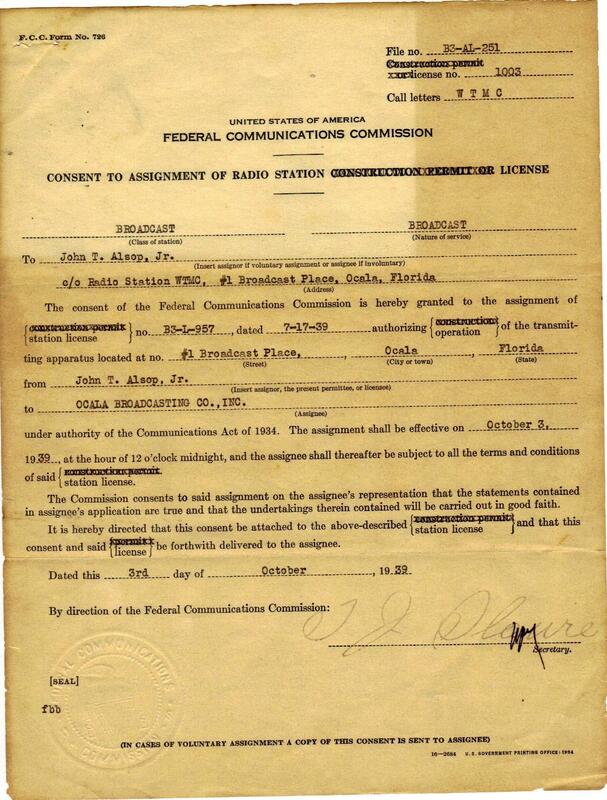 During those early years there was no other radio service for miles from Ocala. The next closest radio station was WRUF-AM 850 Gainesville, 30-miles North of Ocala. 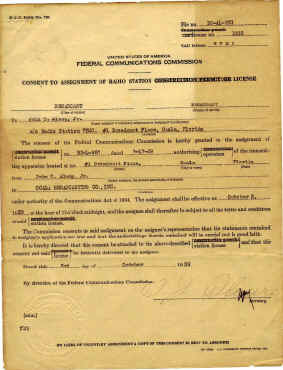 WRUF had signed on the air eleven years sooner during the Summer of 1928 from the University of Florida campus. The original WTMC call letter combination stood for Welcome To Marion County. 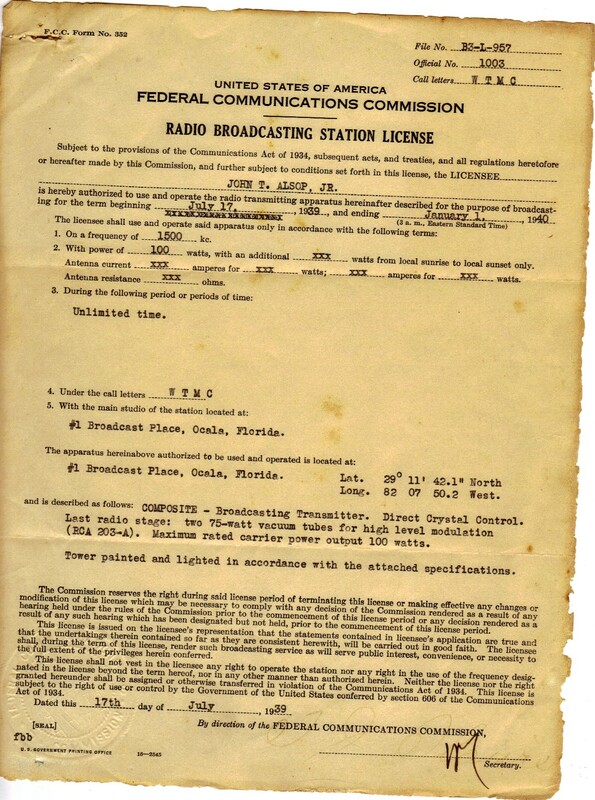 Originally, Ocala’s first radio station broadcast with a modest 100 watts on 1500KC and could be heard as far away as Palatka, Gainesville, Leesburg and Daytona Beach. The WTMC broadcast day began at 7AM with a variety of local programming, ending at 9PM seven days a week. Former Marion County Clerk of the Circuit Court Nick Nicholson was the first morning personality on the new WTMC. It was common to hear Nicholson each morning ring his trademark cow bell exclaiming “…. it‘s time to wake up you scallywags….”. 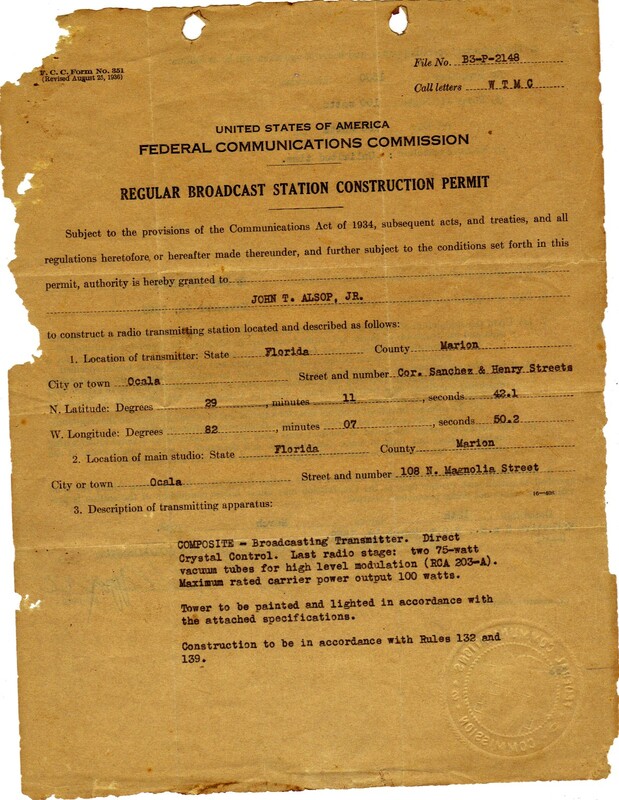 Nicholson’s morning show originated from the original WTMC studio, office and transmitter site which was located on Old Anthony Road (now Northeast 8Th Avenue), about a mile North of Ocklawaha Avenue (now East Silver Springs Boulevard). The original 1939 radio building still stands today at the Northeast corner of Tuscawilla Park - Ocala’s oldest recreation center - bearing its original wood framed, white painted exterior which now serves as the Senior Services Building, a part of the City of Ocala Parks and Recreation Department. WTMC remained Ocala’s ONLY radio station for 14-years until Ocala's second radio station, WMOP-AM 900, began broadcast service in 1953. Although unconfirmed, WTMC’s original owner was David T. Allsop who also served as station manager. Many believe Allsop was actually a front man for the true station owner though Allsop claimed ownership for many years after his departure in 1948. WTMC was later sold to Ocala’s only newspaper - the Ocala Star-Banner. 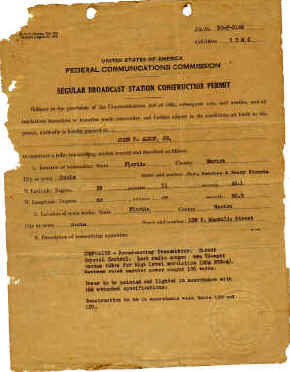 Long time Star-Banner publisher R. N. “Bert” Dosh assumed WTMC’s station management duties but soon promoted WTMC’s sales manager, Hal Davis, to station manager. Davis had been affiliated with WTMC from the beginning and was on a first name basis with the local merchants. Before joining the station, Davis had been very much involved with boxing as a fight promoter. WTMC had been affiliated with the NBC Blue Network, later switching to the NBC Red Network. When NBC split the two networks into the NBC and ABC Radio Networks, WTMC remained an NBC affiliate, airing the network news programming for many years. Other programming remained local as the station became more heavily local news and recorded music oriented. Musically WTMC had an MOR format, playing mostly big bands and other popular tunes of the era. Nick Nicholson left his full-time morning show to campaign for the office of Marion County Clerk of the Circuit Court, an election he won and an office he held from 1952 until 1979. Although Nicholson’s new full time job was now Clerk of the Court, Nicholson remained with WTMC during the football season on a part-time basis as a high school football color commentator. Nicholson added his own style and personality each Friday night while News Director Bill Mansfield called the Play-By-Play action from Ocala‘s famous Booster Stadium. By 1954 WTMC applied for a power increase to 1,000 watts full-time. The request was granted, but the Federal Communications Commission stipulated WTMC move from its original 1500KC frequency to 1290KC.